WOGA loves animals.. especially the so-ugly-they’re-cute ones! The annual World’s Ugliest Dog contest was held Saturday at the Sonoma-Marin Fair in Petaluma, California. The winner was a bulldog named Zsa Zsa, who came with her owner Megan Brainard all the way from Anoka, Minnesota, to enter the competition. Zsa Zsa won a $1,500 cash prize. Judging was based not just on appearance, but personality, too. 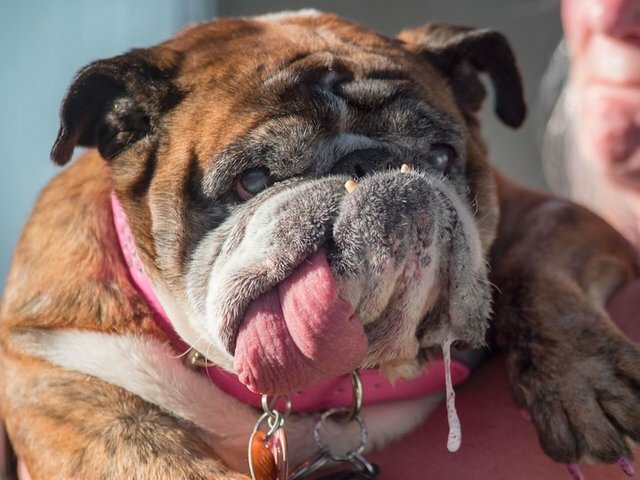 Zsa Zsa, an English bulldog, slobbers her way to the winner’s seat of the World’s Ugliest Dog contest.